House of Lords and House of Commons during King Charles I's reign, c. 1640-42, artist unknown. National Portrait Gallery, NPG D18316. Reproduced under a creative commons license. In late October, several newspapers reported new proposals for reform of the House of Lords. It was suggested that its membership be cut to 600; that peers be limited to fifteen-year terms; and that future appointments be made not by the government but by all political parties, according to their average share of the vote at the previous election. These proposals are the outcome of ten months of investigation by a committee headed by Lord Terence Burns. For those unhappy with the patently unrepresentative nature of the upper house, the proposals of this committee are likely to be a disappointment. The fact that the reduction to 600 members will not be realised until 2027, and that more drastic change (such as abandoning the hereditary element altogether) is not being proposed, makes the committee look timid. As so often in the face of frustration at contemporary political issues, I am led to reflect on what might be learnt from paying more attention to the debates of the seventeenth century. The purpose, function and constitution of the second chamber was a major issue during the period of the English Revolution. In the space of less than two decades (from 1640 to 1659) a variety of models were not only proposed and debated, but even enacted. Early seventeenth-century accounts presented the House of Lords as a key component of England's mixed constitution. It provided an institutional setting for the aristocratic element, alongside the King (who embodied the monarchical element), and the Commons (which represented the democratic). However, the composition of the upper house (and therefore what was meant by the term 'aristocracy'), and even its very existence, came up for debate during the Revolution. Statue of Charles I, Westminster. Image by Rachel Hammersley. 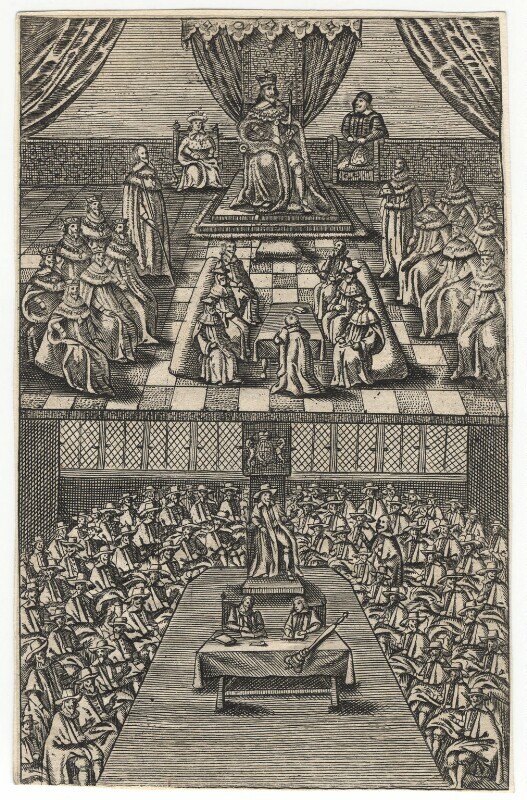 The House of Lords had already become a source of some concern even before the outbreak of civil war in 1642, due to the inclusion of bishops among its voting members. Many Puritans opposed episcopacy (the rule of bishops within the church) and they were especially concerned about their ability to wield political power. The Bishops' Exclusion Bill, which was passed on 13 February 1642, removed them from the House of Lords, thereby reducing the political power of the established church. Bishops only returned to the Lords as a result of the Clergy Act of 1661. Statue of Oliver Cromwell, Westminster. Image by Rachel Hammersley. By 1649 the House of Lords as an institution was under attack. The Lords was seen as the natural supporter of monarchy and so it was feared that its members would favour a settlement with the defeated king on his terms. Consequently, after the purging of the Commons to remove those MPs thought to be sympathetic to a settlement, the remaining MPs declared the Commons to be supreme, insisting that it would, henceforth, rule without the House of Lords. The purged Commons then initiated the King's trial, which ended in regicide. It also held onto power in the aftermath of that seismic event. Between January 1649 and April 1653 England was ruled by a unicameral system in which power was concentrated in the 'Rump' of the old Parliament (those MPs who remained after the purge), without any second chamber or single figurehead. The rule of the Rump Parliament was short-lived. It was dissolved by Oliver Cromwell in April 1653, but this did not prompt the return of a second chamber. The Rump was replaced by the short-lived Nominated Assembly or Barebones Parliament, which was also a unicameral body. It was in turn replaced, in December 1653, by the Protectorate, governed according to the Instrument of Government (the first written constitution in English history), which declared that a single chamber parliament would rule alongside the Protector and his Council of State. It was during the early phase of the Protectorate that the absence of a second chamber to rein in or check the power of the Commons started to be seen as a weakness. Consequently, when a revised constitution, the Humble Petition and Advice, was drawn up in 1657 one of the main changes imposed was that the parliament was to be bicameral. The new second chamber was not, however, to be a House of Lords on the old model. Known simply as the 'Other House' it was a small body consisting of between 40 and 70 life members who were nominated by Cromwell as Lord Protector, subject to approval by the Commons. 'The Use and Manner of the Ballot' shows Harrington's 'senate' in the process of voting. The Oceana and Other Works of James Harrington, ed. John Toland (London, 1737). Private copy. Writing in the midst of this debate and experimentation surrounding the upper chamber, it is perhaps not surprising that James Harrington voiced strong views on this element of the constitution. In The Commonwealth of Oceana, which was published in 1656 when the weaknesses of the Instrument of Government were most acute, Harrington explicitly insisted on the need for a bicameral system to balance and control the power of the lower house, and he set out very clearly both the composition of the second chamber and the role that it was to play. Harrington argued that the second chamber, or senate as he called it, should be composed of a natural aristocracy. This has led some commentators to view him as a supporter of privilege, but his conception was far removed from a traditional aristocracy. Indeed, the membership of his senate was more democratic not just than other second chamber models of the time, but also than our current House of Lords. In the first place, though he used the term 'aristocracy', birth was to play no part in the choice of senators, since there were to be no hereditary peers. Instead, members of the senate were to be chosen on the basis of wealth and merit. While the criterion of wealth might appear exclusive, the basis on which Harrington justified and applied it was remarkably inclusive. The wealth criterion was justified partly on the grounds that money was necessary in order to engage in the study and travel required for the acquisition of political wisdom. Moreover, the threshold was set extremely low by the standards of the time. Senators were simply required to have an annual income of £100 in land, goods or money. Given that, under the Instrument of Government, the property qualification just for voting in parliamentary elections was set at £200 per annum, Harrington's provision is very generous. In addition, by instituting an agrarian law that was designed to ensure a wide distribution of landed property, and by not relying on property in land alone, Harrington's plan would open the door to social mobility. Nor was wealth to be the only criterion, since to become a member of the senate one also had to be chosen by the people who were to judge potential candidates on the basis of merit alone. Finally, Harrington sought to prevent the senate from becoming an entrenched élite by firmly rejecting the idea that senators should sit for life and instead making them subject to rotation of office, so that each senator would serve for a period of just three years, and at the end of each term would have to spend an equivalent term out of office before becoming eligible for re-election. It is testimony to Harrington's radicalism that these proposals go far beyond those of the Burns committee today. Imposing an agrarian law might be a step too far, but electing the members of the upper house according to merit and subjecting them to rotation of office would go some way towards removing the appearance of an entrenched political elite.